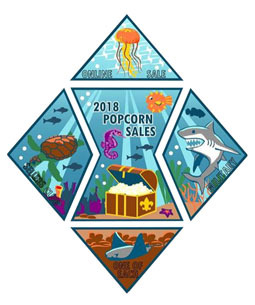 A popcorn sale is pretty simple but there are some details that will make the sale a lot smoother for you and your unit. Be sure to share important dates with the families in your unit. Any resource or form you can’t find on the website, you can email your District Kernel or your District Executive for assistance. To make sure we provide the very best product to all of our customers please take a minute to read the show and sell return policy. 1) Any product containing chocolate that is ordered as part of your show and sell order is non-returnable. 2) Please review your order and keep in mind that we will attempt to have inventory on hand at the popcorn warehouses to fill your needs. 3) Any product that is returned to the warehouse must be in the original packaging, unopened and in sellable condition. This includes product that comes in gift boxes, as they must be sealed with the original tape. Last day to return is October 19th. 4) If you receive damaged product please email albert.gallegos@scouting.org for replacement instructions immediately so that we can help correct the problem right away. To make sure we provide the very best product to all of our customers please take a minute to read the take order return policy. 1) Your take orders is non-returnable. 1) Payments can be made at anytime during the sale. Your Show & Sell balance is due by October 19, 2018 and final payment is due December 1st, 2018. 2) Payments can be made at either Council Service Center (in-person or by mail) or at the popcorn warehouses during distribution (see pages 11-12). Please make your SINGLE check payable to Sequoia Council, BSA. If paying by a personal check please make sure to include your unit number in the memo field.